Click on image to enlarge. The initial research question (purple), grows into two questions (blue and red). Red questions have been ignored or understood only at superficial levels. 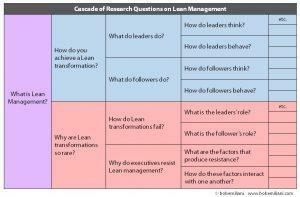 Is Lean management research serious? Well, some is and some is not. 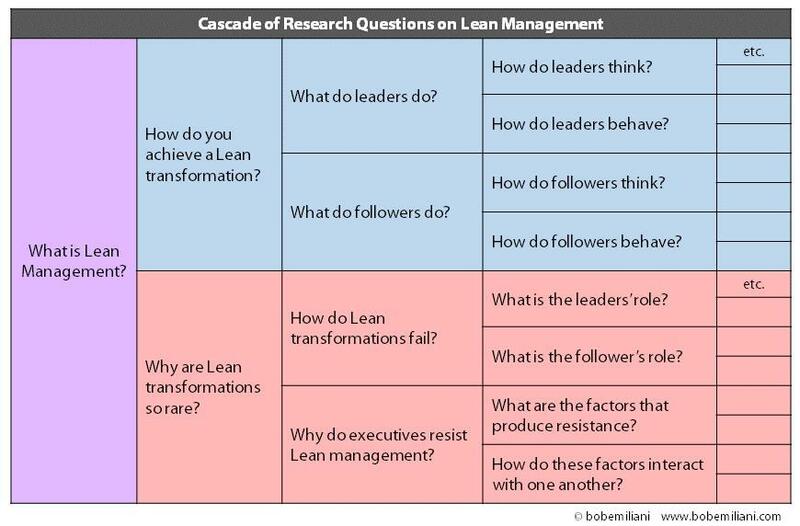 The image at right shows an example of a cascade of research questions beginning with the question, “What is Lean management?” Subsequent research questions, shown in blue, seek to characterize Lean transformation success, the roles of leaders and followers, etc. The vast majority of research as focused on the questions in blue. The research questions in red seek to characterize Lean transformation process failure, the roles of leaders and followers, etc. This line of research questions has been avoided by the leaders of the Lean movement as well as some prominent academics who promote Lean. However, it is within the last several years that the research questions in red have been pursued by greater numbers of academic researchers. Given that the research questions shown in blue have been the dominant focus for 30-plus years, one can easily conclude that research on Lean management, as reflected in popular writings, is not serious because it has led to the growth of one principal line of questions: “How do you achieve a Lean transformation?” In other words, the focus is on how to succeed with Lean, and has ignored the opposite outcome of failing to achieve a Lean transformation — from which there is much, if not more, to learn. The resultant publication and outcome reporting biases has presented an unrealistic picture of Lean. My research and writing are unique because I have pursued both major lines of research (blue and red) for more than two decades, and have gone deep into the details to find the ultimate truths. In contrast, the popular research on Lean success and Lean failure tends to be superficial — “first-order” level of analyses (i.e. first or second “Why?”). For example, Lean transformation success is often stated to be the result of “committed leaders.” This omits the details of the factors that make leaders committed to Lean. Lean transformation failure is often stated to the result of “leaders who cannot let go of command-and-control.” This omits the details that make leaders prefer “command-and-control.” In particular, studying the red questions reveal ideologies that favor the status quo (i.e. continuation of Classical management), which are undiscoverable if one studies only the blue questions. These ideologies are pervasive and have proven to be enduring, despite their great flaws. But, by knowing them, one can identify countermeasures. These “first-order,” surface-level, causes may be true, but they do not illuminate the core of executive’s motivations and interests. Instead, they reflect the lived experiences of the authors and their informal analysis of the problem. Serious research must be more than a collection of commonly known “first-order” observations (see example). Such work, while informative, does not identify the core problems from which specific solutions can be identified and tested. The result remains what it has been for decades: Islands of Lean success and a mountain of Lean transformation failures. In other words, little progress is made in problem-solving when the problem is understood on a “first-order” level of analysis. A key characteristic of serious research is having an understanding of prior research studies, and documentation of previous research so that readers can easily follow the reasoning contained in the logical analysis of the problem. Without such knowledge and visible effort to build upon the work of others, the resulting research is necessarily of lesser quality and utility. Research is a specialized skill which requires many years of training and practice. Absent that ability, research findings are destined to be “first-order” and of limited value. Unfortunately, research in Lean management has usually ignored inconvenient research questions – the kind of questions (red questions) that undercut the promotion or advancement of Lean management. Research that avoids certain questions reveals itself to be of a political nature in that it has a specific agenda to advance and seeks to generate pre-determined outcomes. Serious Lean research is scientific in its quest to reveal the truth, no matter how favorable or unfavorable the truth may be. That is the natural outcome when research is serious, having no agenda and no pre-determined outcomes. The full picture initiated by the first research question, “What is Lean management?,” is revealed, for the benefit of all who are interested in Lean management. Thus, serious research serves the interests of the Lean community better than research that is tainted by publication and outcome reporting biases and motivated by narrow political or business interests dedicated to advancing Lean management. For Emiliani’s blue research questions, see Better Thinking, Better Results, Practical Lean Leadership, REAL LEAN (Volumes One through Six), and academic research papers. For Emiliani’s red research questions, see Moving Forward Faster, The Triumph of Classical Management Over Lean Management, and the Supplement to Triumph of Classical Management.